Crazy Eights is popular children's card game where eights are wild! 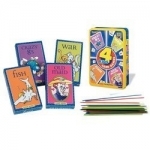 The game is especially appropriuate for kids because the rules are so simple – just match cards by color or by number, and the first one to play all their cards the with winner. Crazy Eights can be played with a standard 52-card deck of playing cards, or with one of the specially-designed Crazy Eight decks that feature fun and colorful illustrations. Each player is dealt five cards, face down, one card at a time. The remaining cards are placed face down to form the draw pile. Turn the top card face up next to the draw pile, which serves as the discard pile (if the initial discard is a "Crazy 8", put it back in the draw pile and draw another card). Play begins with the player to the left of the dealer, who places one card on the discard pile. This card must match the top card by either color or number. All "8" cards are "crazy" and act as wild cards – they can match any card, regardless of color or number. After a player plays a "Crazy 8" card, he has the privilege of naming the color which the next player must play. Play passes to the left. If a player is unable to match the top card by color or number, or play a Crazy 8 card, he or she must draw one card at a time from the draw pile, until they are able to play. If there are no more cards in the draw pile, the player must pass. The first player to get rid of all their cards in their hand wins the game! Note: Crazy Eights is a simplified version of the popular UNO series of card games. Play a Flash-based version of Crazy Eights online against the computer or against live opponents. A Windows version of the classic card game. A Windows version of the famous card game that supports up to 10 players using two decks. Learn about the game, with rules, variations, and links to other sites.